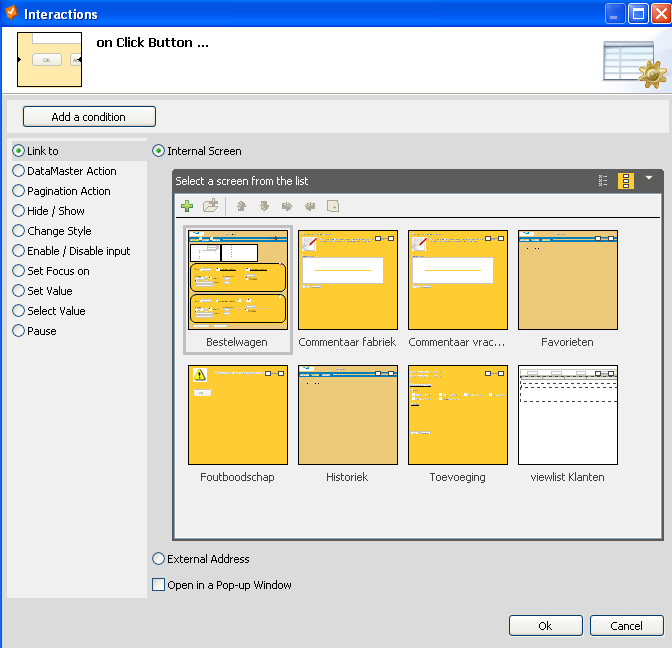 Create an action on clicking a button that appears only when other button is clicked. go to an other sheet without clicking? I want to close a pop-up screen by clicking a button (see the image in attachment : the button "OK" or "Annuleren" = Cancel). Also i want to remove the title "Double-click here to close" from the pop-up screen. To close a 'pop up' you create in your prototype, just create an "On Click" + "Hide" event for a button, with the 'pop up' as the target to be hidden. Just define a navigation event in the ok and Annuleren buttons to the screen that launched the popup. What is a navigation event? I know the event "on Click" and then i can use the interaction "Link to"; and i make then a link with the screen that has called the pop-up screen (see image). But this method has a great disadventage : on the screen that has called the pop-up screen are fields (not linked with data) and this fields are cleared because the page is reloaded. This is not the case when i close the pop-up with the double-click on the title. The navigation event is the Link to. I'm afraid you will have to use variables to maintain the values of your inputs and define onPageLoad events so that when the page is reloaded (when the pop up closes) the values from the variables are set to the input fields.